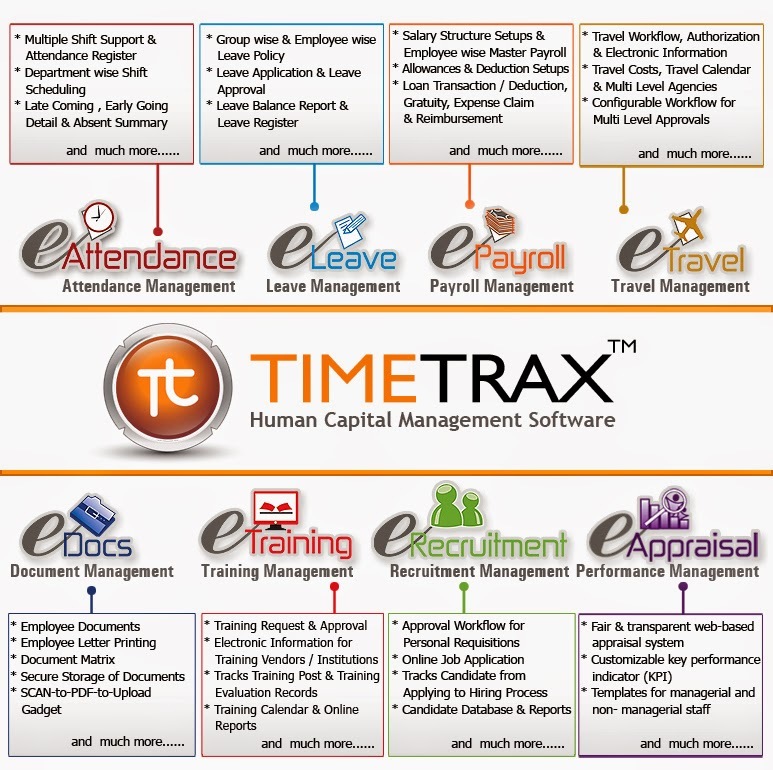 Human Capital Management Professionals' Blog: What does TimeTrax offer to the HR Manager? Really, so What does TimeTrax offer to the HR Manager? A truly robust Human Capital Management Software solution, TimeTrax places tremendous power and precision in the hands of the HR department. From visibility into every action or transaction that an employee makes in the organization through the use of web-based eDashboard to granting each employee the flexibility and comfort of self-service for applying and viewing statuses of leaves, travel requests, expense approvals etc. through the use of smartphones and handheld devices. TimeTrax thus offers value to each individual in the organization individually and the HR department collectively; thereby improving its acceptance and ensuring a quick turnaround time coupled with a marked ROI. TimeTrax achieves this feat by bringing the various HR functions under one unified web-based platform – from the basic monthly routine processes of Attendance/Leave/Travel/Payroll management to the periodic processes of Hiring/Documentation/Training/Separation management. The system goes on to provide the complex and highly strategic modules for Appraisal/Performance management and finally, the robust eDashboard for the senior management’s reporting needs. Nearly 1,000+ business setups have taken benefit from the TimeTrax suite over the last 16 years. Taking note of which TimeTrax has been honored with the title of ‘Best Human Capital Management Software’ at 3rd Global HR Excellence Awards 2012 for its outstanding achievements and exceptional performance in IT industry, both within Pakistan and also in various countries where the solution is available through the company’s Reseller Network. This award is truly an acknowledgement of the revolutionary Human Resource Information System, powered by the dynamic team of software experts at EfroTech. Building on its specialization of delivering core BPS – Business Productivity Solutions – on the web-based and SAAS/ASP models, EfroTech is regarded as a major player in the HRIS/HCMS and Supply Chain Management solutions space in this region. 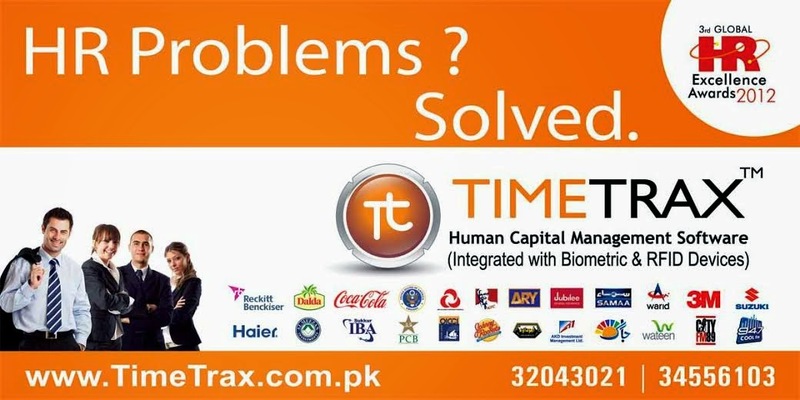 Generic in its design, TimeTrax caters to the needs of Banks, Financial Institutions, Education, Engineering, Pharmaceuticals, Chemicals, Information Technology, Telecommunications, Distribution, Healthcare, Trading, Shipping, Logistics, Media And Communication Industry with Organization size ranging from 15 Employees at Radiant Chemicals to an organization of 8,000+ Employees at Coca cola Beverages Pakistan Limited. Biometrics-based identification and access control is what makes the system most accurate and dependable. Utilizing fingerprint recognition as the core identification method helps in solving the complex problem of ensuring foolproof security. Staff can get access through fingerprints, RFID Cards or via their ID & password – or a combination of all of these. Management Reporting is offered through TimeTrax as a variety of helpful tools to reduce time spent on paperwork and increase visibility to workforce. The Manager’s Dashboard – eDashboard – provides a quick overview of their entire workforce each day highlighting the number of late arrivals, absences, time-cards pending approval and leave requests. The most likable feature about the system is the leave request function, their employees can go in, put in a leave request and it goes in to their manager automatically and can be approved. Previously, the managers used to get faxes and emails from any of their various locations in multiple cities on log sheets, which they would then have to enter manually. Now they have gone from a labor intensive, inaccurate system to something that is not only much more accurate, but provides visibility to the data, in one window. TimeTrax system calculates the time each individual has worked based on pay rules, record their arrival and departure, providing managers with detailed information about attendance records, absenteeism, overtime including holiday and leave pay. It has multi-currency and multi branch setup, Loan Transaction, loan deduction, gratuity, expense claim & reimbursement, Complete track of quarterly, half-yearly and yearly allowances, Monthly payroll, pay-slip, salary advice, tax statements, EOBI statements and provident fund can be computed easily through ePayroll. TimeTrax also offers eLeave, an easy to use workflow tool that simplifies the process flows of planning, applying and approving of leave(s). Employee Self-Service (ESS) feature empowers your employees and department heads to self-manage leave applications and approval flow anywhere, anytime, through any browser and even on handhelds through mobile app.Employee’s Electronic Travel Manager through eTravel is a step forward in that direction which allows functional heads to manage and control their travel budgets with a click of a button, without introducing too many documents/formalities in the process. It has widely been appreciated and embraced by the organization due to its flexibility and user-friendly interface. Shifa Ibrahim, Global HR Projects Manager, Global HR Business Partner Finance, IM & Marketing at AkzoNobel Powder Coatings states: “A truly Generic solution, eTravel is a lifesaver! Saving at least 10% of the time for HR, Admin and Finance personnel – even Line Managers – due to its comprehensive features which cover the whole Leave and Travel authorization cycle in almost every single industry vertical. Strongly recommended that HR professionals look into this intuitive solution and save valuable process time." Not only a travel workflow tool that manages authorizations and monitors travel costs, it also acts as a link between the organization and the travel agents; maintains the travel calendar of the employees and the organization; keeps a track of the expenses and acts as the employees’ travel manager. It manages the Travel Workflow and Authorizations, shares information electronically with travel agents, tracks travel costs, and the corporate Travel Calendar is available online to promote effective collaboration. EfroTech is now a global software solutions supplier for numerous Fortune 500 companies, providing services in Afghanistan, Kenya, Uganda, Tanzania, Rwanda, Sudan, Nigeria, Oman, UAE covering ASEAN, Central & South Africa through its resellers and further has its software deployments in India, MENA, Europe and Latin America. The footprint is growing further at a tremendous pace. In all, TimeTrax is able to deliver for the entire needs of any organization – from the CEO to the HR Manager to every single employee in the organization. 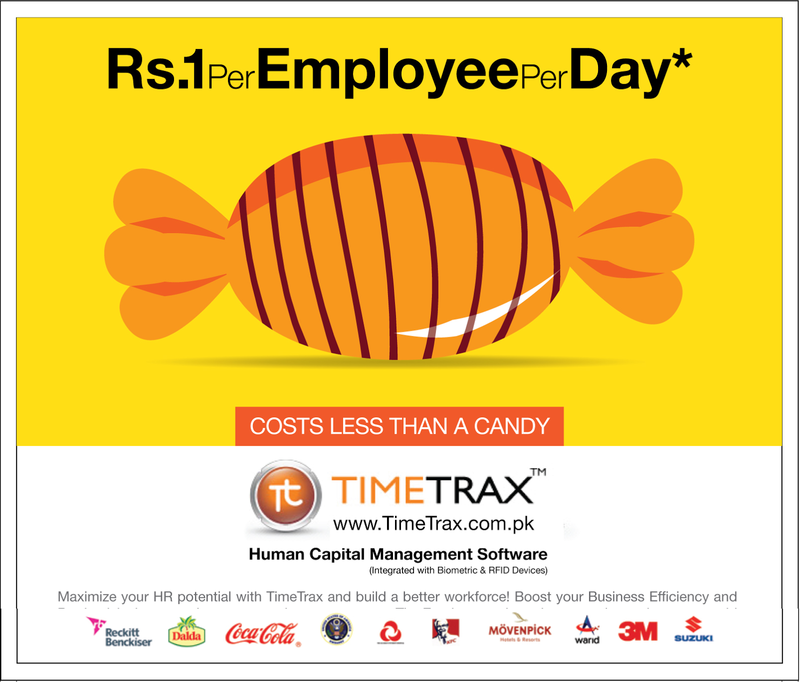 Rightly thus TimeTrax is termed as ‘The Best Investment for your Human Capital’.